Well, that settles that. A new solicit for Marvel's November titles confirms the rumor that Miles Morales, the Spider-Man of the Ultimate universe, is on his way to the regular Marvel universe in Cataclysm: The Ultimates' Last Stand #2, and that does not bode well for everybody else. 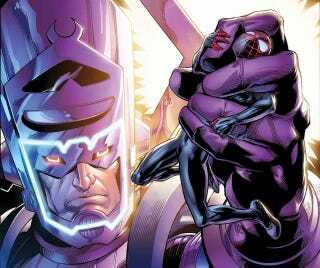 Comic readers know that the Ultimate universe is already in trouble, since the 616-universe Galactus came over at the end of Age of Ultron miniseries (and the entire Ultimate line has been flagging in sales). Since then, he's merged with his Ultimate equivalent, the swarm of robot drones known as Gah Lak Tus, and is even deadlier than usual, and the rumors that Marvel could completely end the Ultimate line were rampant at this year's Comic Con. But what to do about its break-out star, Miles Morales' Ultimate Spider-Man? Send him to the official Marvel universe, obviously. There's still no announcement as to whether Marvel's Ultimate line is actually ending, but I'd say the loss of Miles makes it extremely likely. Miles is the best thing in the Ultimate U. by a longshot, and without him, I sincerely doubt there's much point in Marvel keeping it around. At least it'll go out with a bang — or, if Galactus has his way, a chomp.